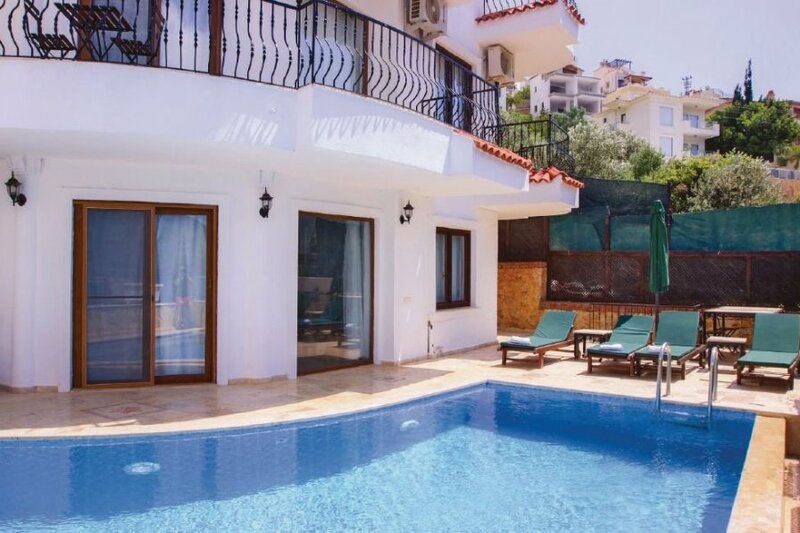 This beautiful house is situated in Kalkan in a sunny location in the immediate vicinity of the sea. This comfortable home is very modern and tastefully decorated. It is also equipped with air conditioning. The four-storey house has a garden plot with many pleasant corners where you can relax. The spacious house has three living rooms and three kitchens and a sufficient number of bedrooms and bathrooms, making it an ideal accommodation for very large families and groups. It offers scenic views of the ocean and the bay and the mountains. You can relax in the private garden near the swimming pool, on which chairs and umbrellas are placed for your convenience. The house is located very close to the beautiful pebble beach of Kisla with a restaurant / cafe. Kalkan is an idyllic resort on the Lycian coast, at the foot of the Taurus Mountains. This beautiful villa is made from brick or stone. The agent has rated it as a four star property so it is a well-equipped villa with above average furnishings. It is also great value for money. This villa has a swimming pool and beautiful panoramic view over water; it is also only 4km from Kalkan. It is set in a very convenient location, just 250 metres away from a stone and pebble beach. There's also a restaurant only 500 metres away.